In 2011 premier Japanese reissue label Dub Store released the excellent compilation King Jammy’s Dancehall 1: Digital Revolution 1985-1989. At the time it was only released on CD and now six years later it was put out on LP. But that’s not all. Dub Store has also issued part 2, 3 and 4. Together these collects a whopping 80 tracks – 20 on each volume. If you also count the dub versions that comes with part 1 it adds up to a hefty 95 cuts of digital niceness. King Jammy was with his Sleng Teng riddim almost solely responsible for the digital revolution in Jamaican music and he and his Jammys label dominated the dancehall scene between 1985 and 1989. During this period he released a vast number of singles, many of which included on these excellent compilations. All four compilations have a similar digital sound, but lyrically they differ for each volume. Part 2 is more rootsy with killers cuts like Cornell Campbell’s Nothing Come Easy, Dennis Brown’s History and Wailing Souls’ Move on. Part 3 offers soundboy burials with lethal tracks such as Robert Lee’s Come On, Tonto Irie’s Ram Up Every Corner and Johnny Osbourne’s Chain Robbery. Part 4 is focused around closed curtains, satin sheets and affairs of the hearts with bouncy cuts like Home T’s If the Rockers Don’t Groove You, Super Black’s One Time Girlfriend and, of course, Gregory Isaacs’ Steal a Little Love. These compilations showcase dancehall history and is a sound addition to any record collection. Japan’s Dub Store Records has recently reissued Courtney Melody’s album Ninga Mi Ninga, a 12 track album in showcase format where the vocal cuts are directly followed by their dub, or dubstrumental, counterpart. This is late 80s digital business produced by the late top engineer King Tubby, who opened a new studio in 1985 and around the same time started three labels, of which Firehouse is probably best known. Ninga Mi Ninga was originally issued on Firehouse and is heavyweight and sparse computerized dancehall. Courtney Melody was at the top of his game around this time and his youthful and enthusiastic style suits the dark and naked productions very well. The lethal title track and the powerful Unite are two prime examples. Danish production duo Maffi is back with a fresh six track EP on innovative German label Jahtari. The set collects original 80s sounding riddims recorded with vintage equipment. 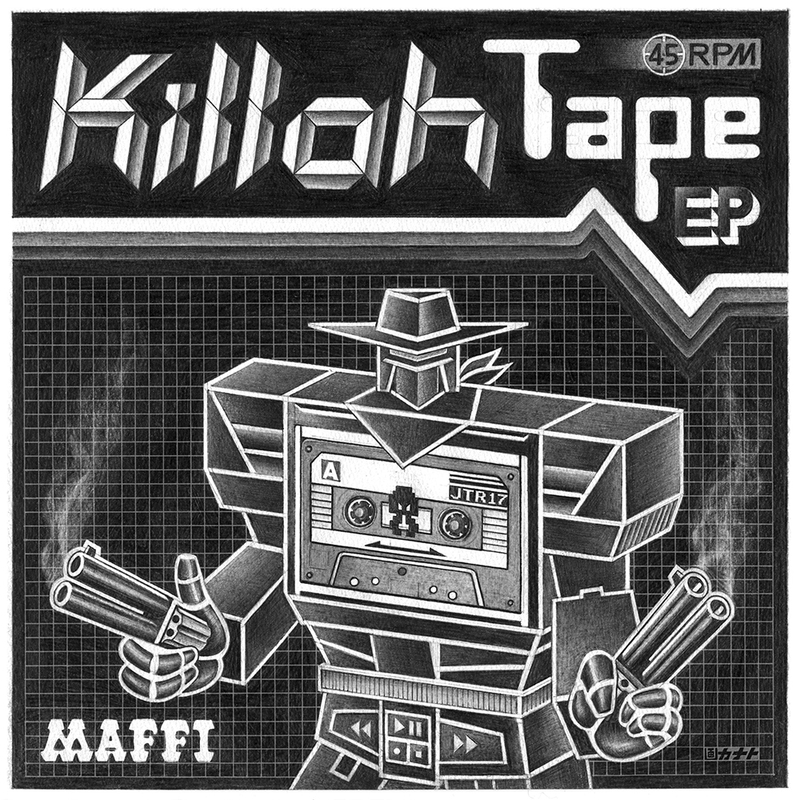 Killah Tape hosts two dub versions and four vocal cuts from French Colonel Maxwell and Junior Roy along with pioneering tongue twisters Peter King and Asher Senator, both from the UK. All cuts are gritty, stone cold killers and the blazing performances and high voltage riddims won’t be forgotten anytime soon. Available on vinyl and digital download. After the release of their joint EP Back To the Roots Jamaican gruff chanter Joseph Cotton and French DJ and producer Atili Bandalero dropped a fresh digital scorcher last year. 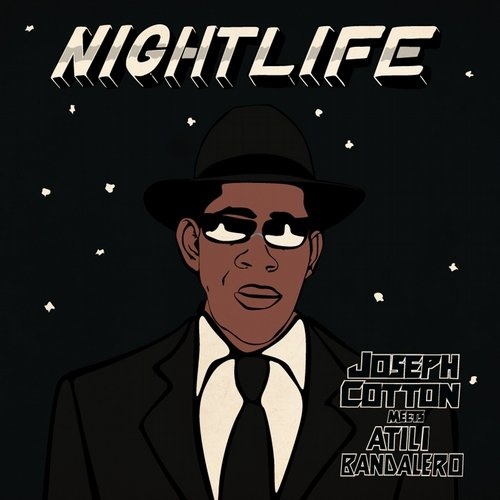 On Nightlife, which includes four new versions of material recorded for Back To the Roots, Joseph Cotton showcases his vintage flow over ten 80s styled digital riddims with different tempos and moods. It ranges from frenetic ska on Another Man, Back To the Roots and Nightlife to dreader and deeper cuts like album opener Chant Down Babylon. 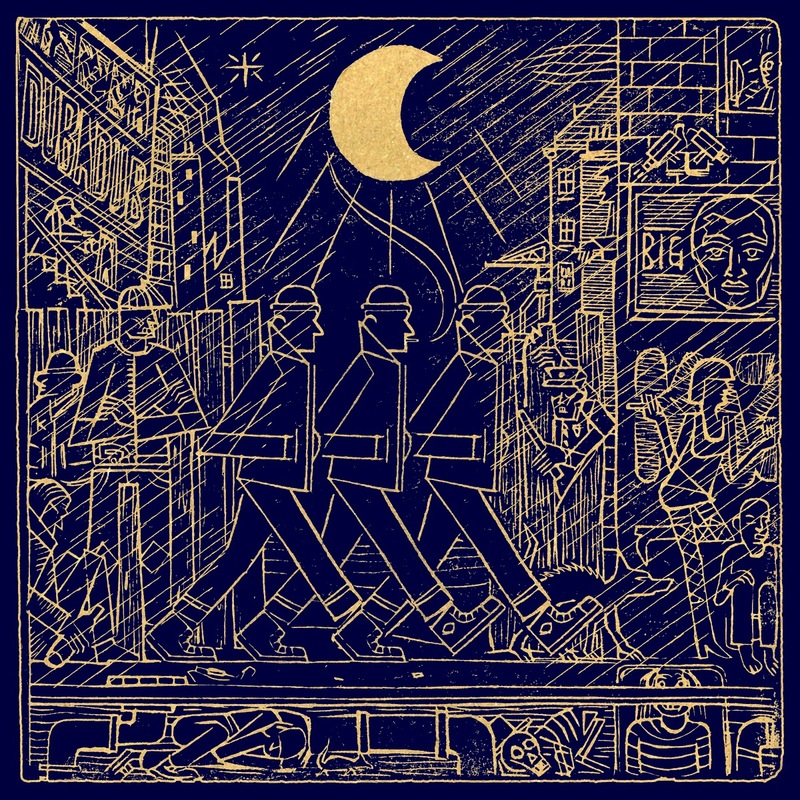 Forward is almost festive with its anthemic chorus and on Money Code the duo borrows from Yellowman’s Body Move and Barrington Levy’s Money Move. Digital albums like Nightlife may sound simple in its arrangements, but if you listen closely it offers a lot of details. And this set is offers both good vibes and clever production. German singer and trombone player Dr Ring Ding has played a key part on the German ska and reggae scene since the late 80s. He took his name in tribute of The Skatalites – who has released a single with the same name – and formed Dr. Ring Ding & The Senior Allstars in the 90s and went solo in the early 2000s. 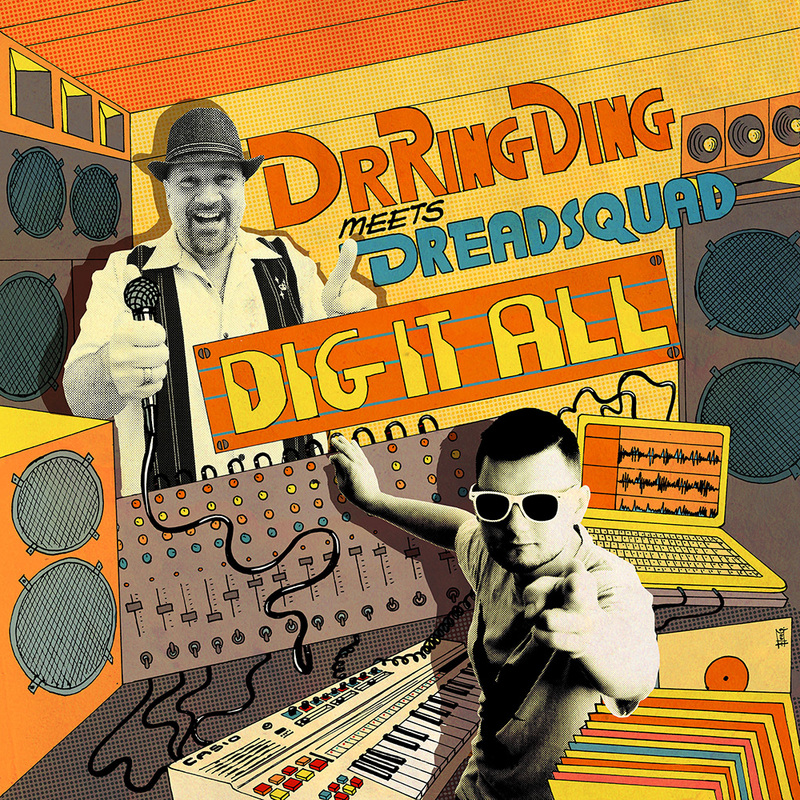 He has worked with most subgenres within reggae, including, ska, roots, dancehall and dub and now he has joined forces with Polish Dreadsquad for an album dedicated to the pioneers of the early computerized dancehall scene, including innovative producers and musicians like King Jammy, Bobby Digital, Augustus “Gussie” Clarke and Steely & Clevie. The title of this 14 track set – Dig it All – is a clever one and catches the sound and atmosphere very well. Dr. Ring Ding might be dismissed as a mere novelty act, but he has a free flow, entertaining lyrics and a feel for catchy melodies and hooks. Dig it All is a playful album from start to finish and the riddims created using loads of classic gear from the old days, for example Yamaha CS-01, Casio MT41 and MT100, Roland Space Echo, Fisher SpaceXpander and the Coron DS-08 drum synth, catch the sound of mid-80s both successfully and respectfully. Keeping up with reggae album releases is hard and I recently came across yet another set released last year. It was German blog House of Reggae – again – that highlighted Tonto Addi’s debut album Dancehall Showcase, an effort with six vocal cuts followed by its dub version. 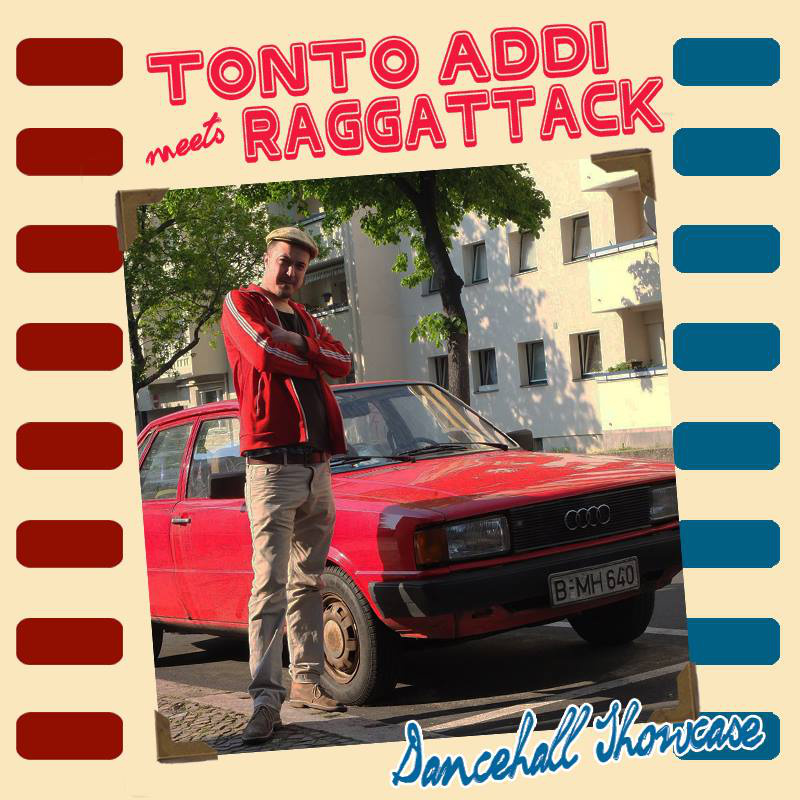 For this twelve track set aggressive French sound system deejay Tonto Addi – who today resides in Germany – joined forces with Spanish producer Raggattack. This is an album that takes you back to the mid to late 80s, a time when producer Augustus “Gussie” Clarke had started to experiment with digital and semi-digital sounds. Dancehall Showcase is in that vein, but compared to Augustus Clarke’s sometimes vivid soundscapes, this set has rather sparse arrangements. The pair’s first track together was We Do the Killing, a tune included on the album but according to an interview Tonto Addi it has a different mix. We Do the Killing is a dancehall banger, and so is several other tracks, especially album opener Slow and the Trevor Junior combination Music a Play. Tonto Addi has a raw, unpolished flow, which clashes nicely against Trevor Junior’s smooth vocals. Mid to late 80s digital reggae has been popular for some time now and original releases usually means big bucks on eBay. So if you are into the digital sounds but don’t have the cash or want to get ruined check this mean and dark album. Reggae powerhouse VP Records follows up on their Jammys From the Roots compilation released four years ago. More Jammys From the Roots is a confusing title, since it hints that it’s a roots reggae compilation. But it’s not. This new edition takes on where the firstleft off – in the mid 80s when computerized reggae was the order of the day and when Wayne Smith’s game changing Under Me Sleng Teng was on everyone’s lips. 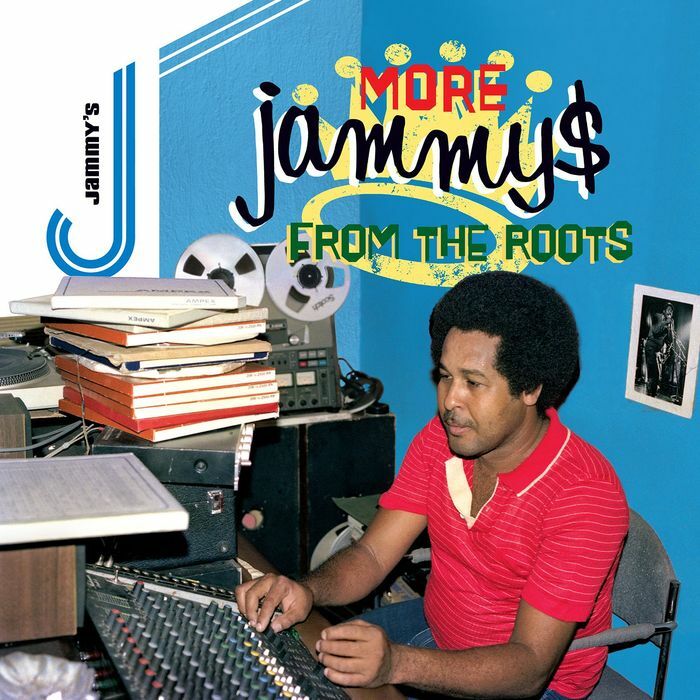 This 32 track set spotlights King Jammy’s mid to late 80s productions and includes lots of fine riddims, both vintage and fresh ones, for example Stalag, Real Rock, Run Down the World and Satta Massagana. Featured vocalists include both legends and forgotten ones ranging from Junior Murvin, Dennis Brown, Johnny Osbourne and Sugar Minott to King Everald, Super Black and Prince Junior. Several tracks on these two discs are made available for the first time on CD and digital download. A delight since many of the tunes are heavily sough-after today, and digital reggae on vinyl from this period also fetch ridiculously high prices on eBay and other outlets. King Jammy managed to revolutionize the sound of reggae in the 80s and if you already have compilations like King at the Controls or the eight disc set Selector’s Choice Vol. 1-4 you’ll know this. But if not, More Jammys From the Roots is a proper introduction to early digital reggae King Jammy style. The newest addition to Germany’s Jahtari label is New Zealand based producer Naram. March of the Gremlins is his debut album and it’s a showcase set featuring veteran singers and deejays like Peter King, Asher Senator, Jah Screechy and Sammy Gold. The riddims are gritty, haunting and in the minor part of minor key. They are obviously designed to create madness on the dance floor and mash down the walls of Babylon. The first Naram produced riddim that reached the Jahtari label was March of the Gremlins. It was initially created on a battered iPod while he was on a bicycle trip across the Middle East. They were obviously impressed by what they heard and I’m not surprised. The riddims that Naram have crafted on March of the Gremlins are rock-hard and better suited for a turntable than an iPod. 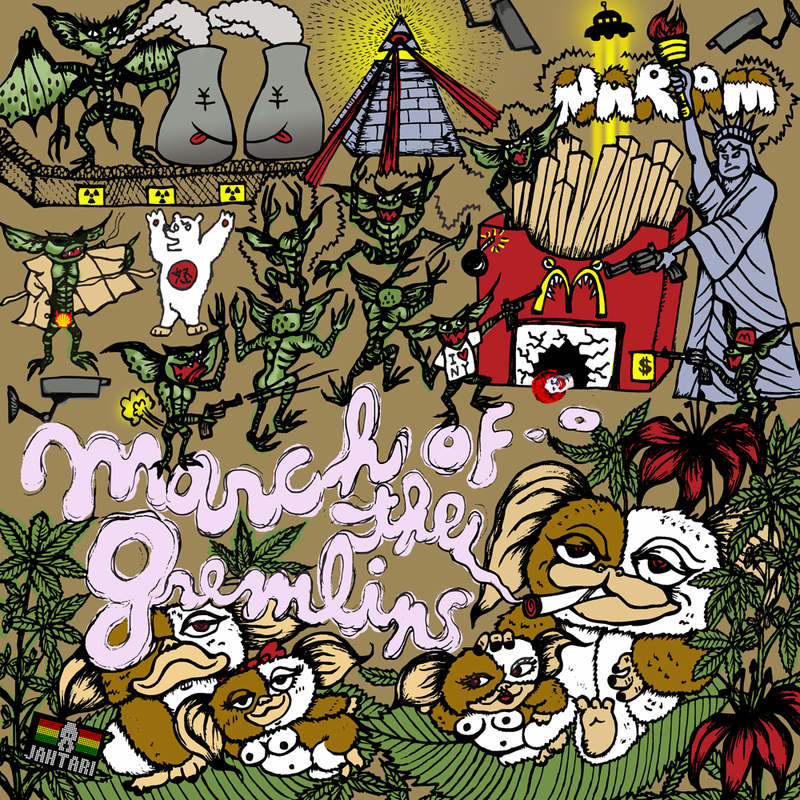 March of the Gremlins is in the same style and fashion as the usual Jahtari output – futuristic, yet vintage, digital and dubby 80s reggae. Fans will not be disappointed. Midnight Walkers is the debut album from French sound system Stand High Patrol, an album full of genuine early digital 80’s vibes combined with dubstep, hip-hop and electronic dance music. The album collects two instrumentals, two semi-instrumentals and nine cuts with vocals provided by the versatile high-voiced Pupa Jim, probably best known for his work with German Jahtari, Danish Maffi and Scottish Mungo’s Hifi. His delivery is in the same vein as flat voiced 80’s champions King Kong, Anthony “Red” Rose, Nitty Gritty and Tenor Saw. Pupa Jim might at times sound a bit like a comic book character or novelty figure, but he’s an expert in giving a song its own style and he sings, raps and shouts over the sparse, dark, deep, mystic and repetitive beats he’s provided with. Among the many highlights are the up-tempo Boat People, the electro-styled instrumental title track and the amusing Home Made, probably the first ever attempt to combine reggae and g-funk. If you enjoy simplistic and head-nodding digital reggae with a contemporary twist, then you should definitely check out this album.